If you are a sweet and savory person like me, these Loaded Chocolate Covered Potato Chips are going to be your snack food kryptonite. They are the perfect mix of salty and sweet. I coated mine with a mixture of seeds, coconut, and dried fruit, but almost any nut or seed would work well. The annoying step with this recipe is the chocolate. Ideally, you should temper it so it hardens at room temperature. This isn’t particularly hard, but it does require some attention to detail, and if I’m being honest, I’ve found that I still screw it up sometimes. Worst case scenario you have to pop them in the fridge for a bit to harden. No big deal! Oh, and buy sturdy chips for these! Kettle chips are good, but I accidentally bought the salt and black pepper variety (which I love for snacking) but the black pepper was a bit much with the chocolate. 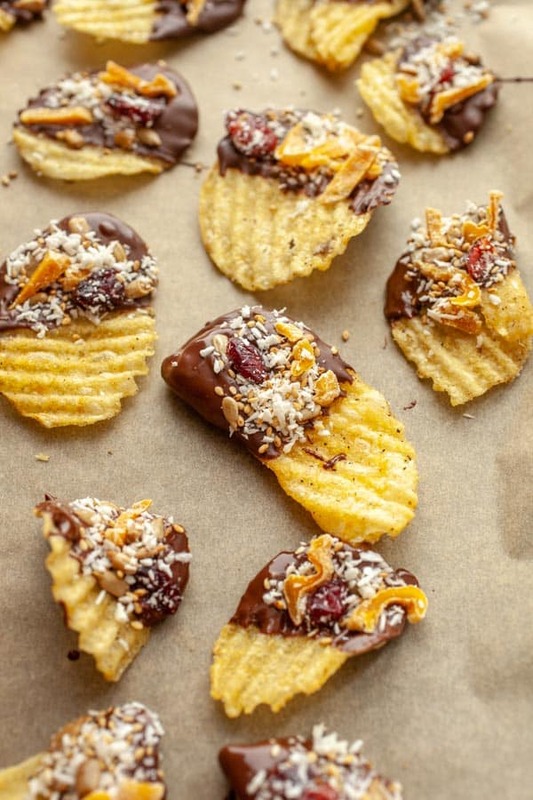 So maybe just stick to the sea salt chips if you are making these Chocolate Covered Potato Chips! These are my favorite kind of dessert: salty and sweet! Ruffled salty potato chips dipped in tempered chocolate and topped with all kinds of goodies: coconut, mango, sunflower, and whatever else you have! 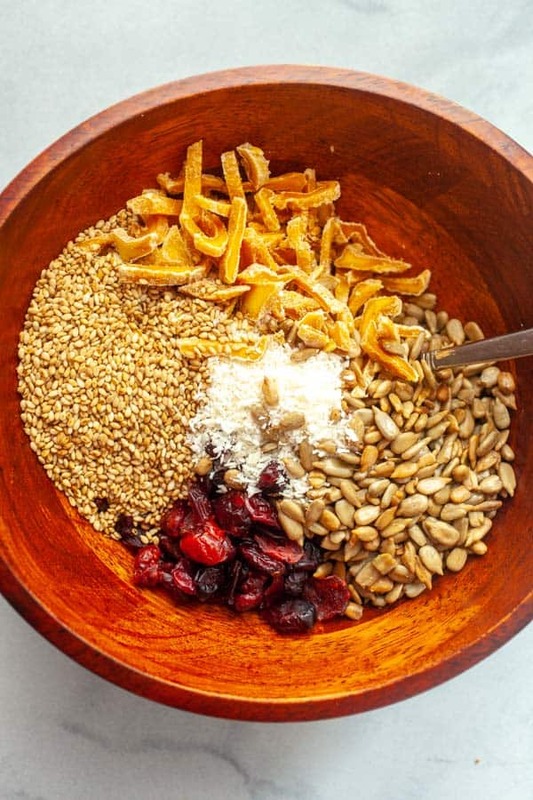 For the toppings, stir together all ingredients in a medium bowl. If you have leftover toppings, they keep great in an airtight container for a few weeks and go well on many things. I like it on oatmeal! 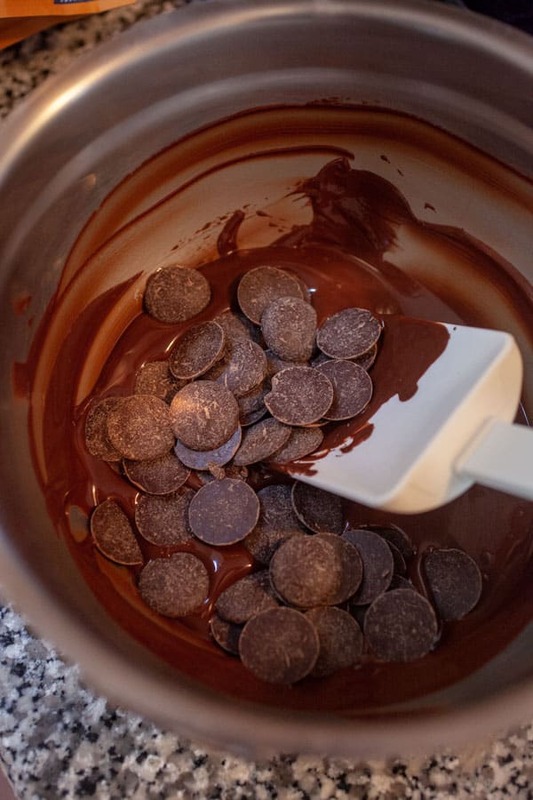 To temper the chocolate, add 3/4 of the chocolate to a dry metal bowl over a steaming (not boiling) pot of water. Stir until the chocolate is melted and reaches about 115 F˚. Be careful that the chocolate doesn’t get too hot or it will seize up. 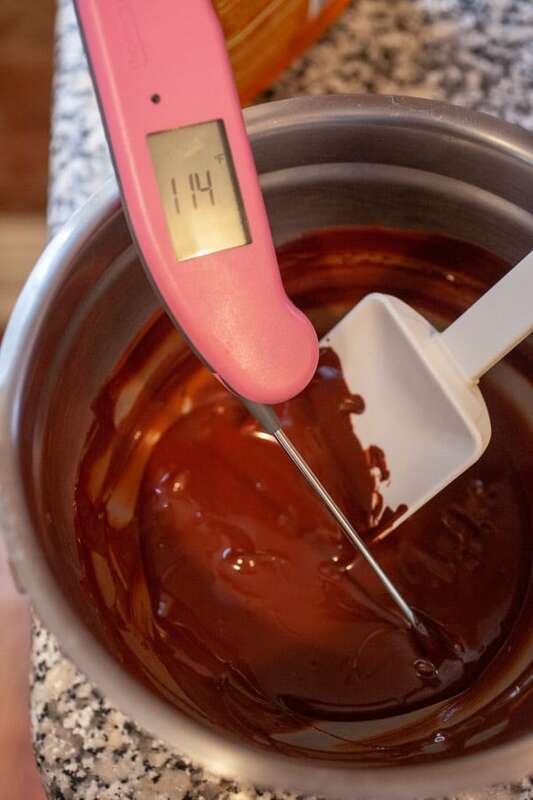 When the chocolate is melted and at that temp, remove it from the double boiler and then stir in the remaining chocolate. Stir constantly while that chocolate melts. It will continue to cool the chocolate down. When the seed chocolate that you added is melted and the chocolate is around 85-90 F˚ it should be tempered and can be used for coating. If it starts to get too thick while you are working with it, you can heat it up quickly over the double boil until it loosens. 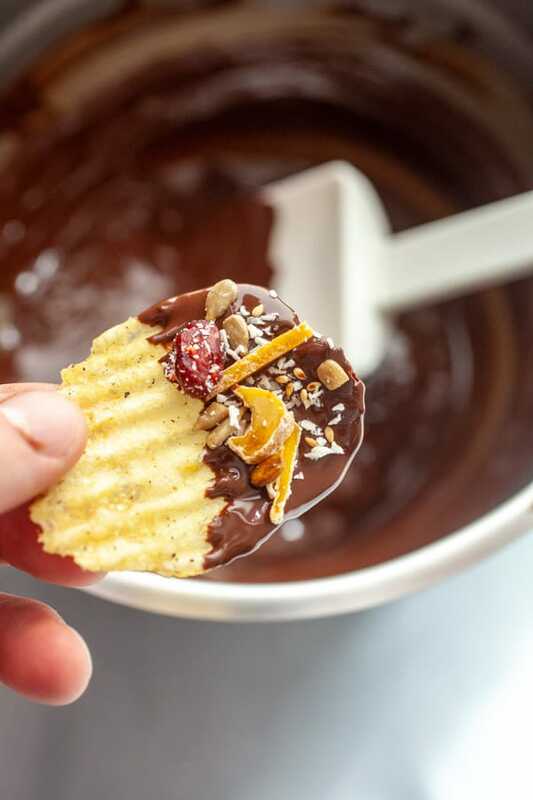 Dip potato chips in the tempered chocolate and coat with toppings. Then place on a baking sheet lined with parchment paper. Repeat until you run out of chocolate or potato chips! 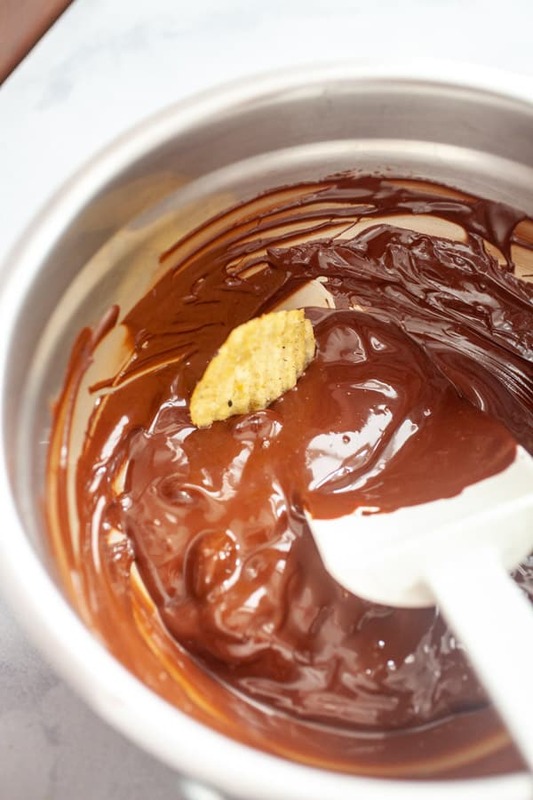 Let potato chips sit at room temperature for about five minutes so chocolate can harden. If you didn’t temper the chocolate correctly, you might have to stick them in the fridge to harden. Not the end of the world! I just raided my pantry for stuff to toss on these chips. I suggest you do the same. Almost any dried fruit chopped up or seeds or nuts would be great. I went with sesame seeds, sunflower seeds, mango, cranberry, and coconut. Take a deep breath. You can do this! If you want to read a completely thorough guide to tempering chocolate, I recommend the Serious Eats walkthrough. 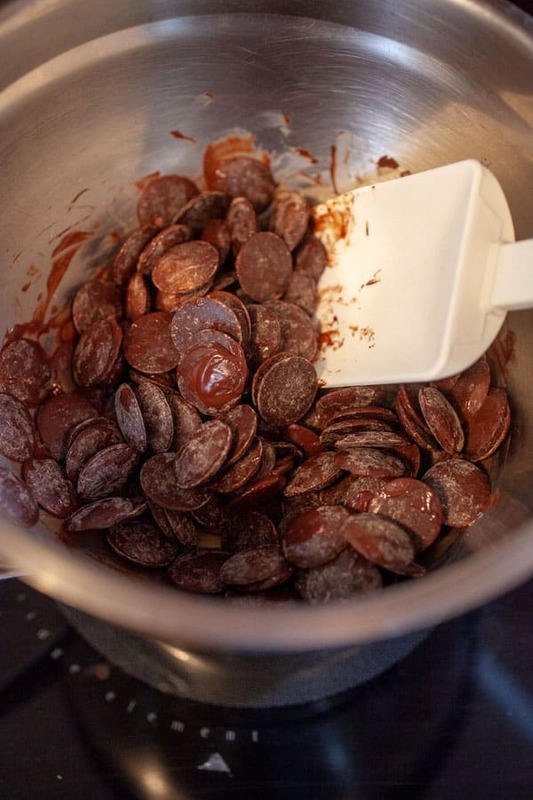 I’ve done all the methods in that walkthrough and I do like the sous-vide method the best, but on this day I went for the classic approach which means I need some chocolate and a double boiler! Melt the chocolate slowly until it reaches about 115 degrees and then you can start adding unmelted chocolate (seed chocolate) which will cool the chocolate and give it the right crystal structure to set at room temperature. Be careful not to heat the chocolate too much or it will seize up and you’ll have to start over. Now at the unmelted chocolate and the goal is to get the chocolate temp down to below 90 degrees and melt all the seed chocolate. I actually added a bit too much seed chocolate in my version. Once that’s done you might have to heat the chocolate a bit more to get it back to about 90 degrees. At this point it should harden at room temperature if you did everything right! As you might guess, a good probe digital thermometer makes this a lot easier. Some expert chocolate people can do it by look/feel, but I still use a thermometer and always will! Now for the easy part! Dip the chips! While the chocolate is still melted, top with all the toppings! YUM! Lay these out on some parchment paper to harden and you’ll be in business. 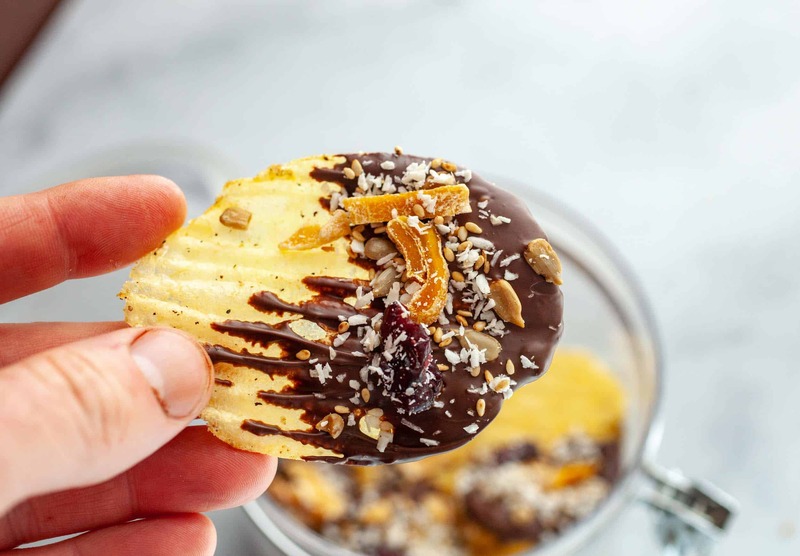 These Chocolate Covered Potato Chips are a great snack and store well for a few weeks at room temperature in an airtight container! They won’t last that long though. Mine were gone in two days! Here are a few other great potato chip snacks!